Born in Mostar. She received her degree in Art History and English Language and Literature at the Faculty of Philosophy in Zagreb. 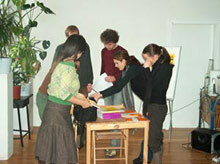 In 2004 and 2005, she attended the Course for Curators (SCCA -Ljubljana). She is one of co-founders of the independent organization Katapult 6 in Ljubljana. She also collaborates with the independent institution KONTEJNER – the Bureau for Contemporary Art Practices (www.kontejner.org). She works as Assistant Curator in the Gallery Miroslav Kraljević in Zagreb (www.miroslav-kraljevic.hr). Born in Šempeter by Gorica. She received her degree in Art History and Sociology of Culture at the Faculty of Arts in Ljubljana. 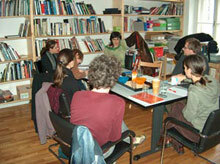 In 2004 / 2005, she attended the Course for Curators (SCCA -Ljubljana). In 2006, she attended the Summer School for Curators in Armenia (NAAC; Erevan). She works as free-lancer in the field of culture and collaborates with P.A.R.A.S.I.T.E. Institute, JSKD of the Republic of Slovenia, MGLC and Pedagogical Society Soča Kanal. She lives and works in Ljubljana. Born in Maribor. She received her degree in Slovenian and Theology at the Faculty for Pedagogy in Maribor. In 2002, she enrolled for the M.A. programme Culture, Philosophy and Education in Central Europe at the Faculty for Pedagogy in Maribor. Between 2003 and 2005 she attended the Course for Curators and the Seminar on Writing on Contemporary Art (SCCA – Ljubljana). In 2004, she was one of co-founders of Open Atelier and TU Association for Promotion and Development of Culture in Maribor. She publishes her texts in various printed media. She works in Maribor as free-lancer in the field of culture. Born in Ljubljana. He is concluding his studies of General Linguistics and South-Slavic Languages at the Faculty of Arts in Ljubljana. In 2000 / 2001, he attended the Course for Curators, whereas in 2005 he successfully concluded the Seminar on Writing on Contemporary Art (SCCA-Ljubljana). He is authoring works that merge poetry, prose and Web/computer art. The red thread of his work is a contextual-formal research of expression, mainly in the field of information/communication technology media and predominantly in the field of Web literature in combination with visual originals. His art work comprises occasional engagement as selector and curator; he also writes on contemporary art. He is currently working as Editor of Web edition of the magazine Mladina. He lives and works in Ljubljana. More at www.jaka.org. Born in Postojna. He received his degree in Art History at the Faculty of Arts in Ljubljana. In 1996 / 1997, he attended the Course for Curators, whereas in 2004 he successfully concluded the Seminar in Writing on Contemporary Art (SCCA -Ljubljana). Between 2004 and 2006, he worked as Programme Director and Curator at the Gallery Zapor in Koper. In 1998 and 1999, he was also member of the Organisation Committee of the festival Mladifest (Students’ Club Sežana). He publishes shorter contributions and texts in various printed media. He is currently employed as Curator of the Coastal Galleries in Piran. Born in Celje. She received her degree in Philosophy at the Faculty of Arts in Ljubljana in 1999. She is currently writing her PhD thesis on “Aesthetical Strategies of Slovenian Visual Arts in the 90’s”. 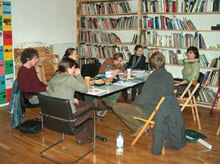 In 2003 and 2004, she attended the Seminar on Writing on Contemporary Arts (SCCA-Ljubljana). In 2005 and 2006, she worked during the summer semester with students of Fine Arts Department at the Faculty for Pedagogy in Maribor. She occasionally lectures on the subject of art and science, mainly on subjects from the field of bio-art. She is publishing the results of her research and professional activities in various publications. She lives and works in Ljubljana.